If you like Slow Cooking, you need this book. With 222 recipes guaranteed to make your mouth water, this book is a long-awaited treasure. 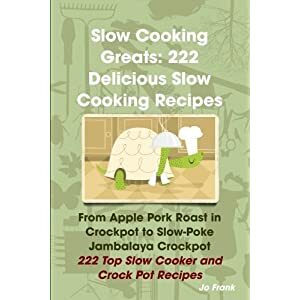 With 222 recipes, the Slow Cooking Greats Cookbook is the only book for slow cooker recipes you’ll need. The recipes are SIMPLE: simple ingredients and simple preparation. You can throw together many of the recipes if you have 20 minutes before you run off to work in the morning. You are likely to have most of the ingredients in your kitchen — no exotic, hard-to-find ingredients in this cookbook. If you love Slow Cooking then this recipe book is a must have. You also will save grocery money. Many recipes call for less expensive cuts of meat since cooking at a very low temperature all day will make meats as tender and juicy as the more expensive cuts. You’ll love this book, the recipes are easy, the ingredients are easy to get and they don’t take long to make. There is an excellent recipe for Crockpot Winning Wings in Sweet and Sour Sauce, and a wonderful Working Person’s Crockpot Country Pork Dinner. My favorite Slow Cookings are the slightly sweet ones like the Pineapple Sausage & Bean Crockpot Meal. There is also a wonderful Ground Beef and Potato Casserole. There is also a really nice Ranch-Style Brisket and Beans which is very easy to make yourself. This book will also give you enough inspiration to experiment with different ingredients since you’ll find the extensive index to be extremely helpful. The recipes are superb. Wonderfully easy to put together and you don’t have to make or purchase a ton of condiments before you have a chance to play with them.